DuPage County lawyers Lynn M. Mirabella, George S. Frederick, Christa M. Winthers, Lindsay C. Stella, and Joshua D. Bedwell were awarded five honors by the Leading Lawyers organization. Administered by the Law Bulletin Publishing Company, each stage of Leading Lawyers nominations involves the recommendation of a trusted peer, discussions with nominees, pre-selection for membership, and advisory board review. 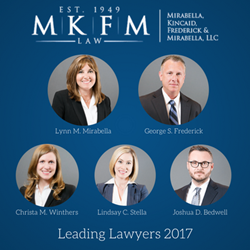 The Wheaton, Illinois, law firm of Mirabella, Kincaid, Frederick & Mirabella, LLC (MKFM Law) is proud to announce that attorneys Lynn M. Mirabella and George S. Frederick have each been awarded as 2017 Leading Lawyers. In addition, attorneys Christa M. Winthers, Lindsay C. Stella, and Joshua D. Bedwell have been recognized as 2017 Emerging Lawyers. The Leading Lawyer award process consists of a four-phase research process. Administered by the Law Bulletin Publishing Company, each stage involves the recommendation of a trusted peer, discussions with nominees, pre-selection for membership, and advisory board review. Lawyers cannot nominate themselves or anyone at their law firm, and upon filtering through all four steps, a winner is chosen and awarded. The Emerging Lawyer award is open to candidates under the age of 40 years old who have demonstrated professionalism, integrity, and knowledge in the early part of their careers. The Law Bulletin Publishing Company mails annual surveys to all Leading Lawyers in each state. The survey recipient can nominate a partner within or outside of his or her firm. Upon anonymous recommendation from another Leading Lawyer, a winner is selected and notified. MKFM Law Partner Lynn M. Mirabella is a respected family law attorney who has been practicing for nearly 30 years. She has received multiple accolades, besides Leading Lawyers, such as “Top Attorneys in Illinois” by Chicago Magazine, Super Lawyers, and pro bono service awards from the DuPage Legal Assistance Foundation. Partner George S. Frederick practices divorce, family law, and represents employees in discrimination and sexual harassment litigation. Mr. Frederick has an Avvo rating of 10.0 and is now a second-time recipient of the Leading Lawyers award. He also been honored with a “Board of Directors Award” from the DuPage County Bar Association, recognized as an Illinois Super Lawyer, and received pro bono awards from the DuPage Legal Assistance Foundation. Emerging Lawyer honoree Christa M. Winthers practices divorce, criminal, and family law, along with sexual harassment litigation. She has previous experience as a DuPage County Public Defender and has received previous honors from the Illinois Super Lawyers organization and the DuPage County Bar Association. Attorney Lindsay C. Stella focuses in all areas of family law and is a contributing member of numerous local bar associations. She has held the distinction of “Rising Star” by Illinois Super Lawyers for three years running. Attorney Joshua D. Bedwell has received various awards and offers pro bono work through the Constitutional Right Foundation. He is a member of the DuPage County Bar Association, Illinois State Bar Association, American Bar Association, and the Chicago Bar Association. MKFM Law congratulates these five recipients on their prestigious achievements. Their service to others is valued, remarkable, and selfless. Each one of these individuals takes pride in advocating for the person in need of legal representation and defending his or her constitutional rights. Established in 1949, MKFM Law operates a comprehensive legal practice with offices in St. Charles and Wheaton, Illinois. The attorneys have over 50 years of experience handling cases involving divorce, family law, criminal law, employment discrimination, civil litigation, and sexual harassment litigation. To receive an initial consultation in DuPage, Kane, Will, or Kendall Counties, call 630-665-7300 or visit http://www.mkfmlaw.com.